Frito-Lay is out front building solar powered plants and improving their product packaging so that it decomposes quickly. We would tell you how quickly but that could be dangerous. There are product spies everywhere you look. Our only safe tip is that they are uses "corn syrup" as a basic ingredient in their packaging. Here you see the UV gang pondering the question - " which soft drink container is heaviest?". Neimen looks like he wants to drink all three before giving an answer. That way he winds up winning no matter what he says. Smart guy. Check out their new Sunchips. We did! We Have Success!!! Ms. Marshall was excited as well. Well it only drizzled a little so it wasn't that bad of a day. We had a mission to try and find things to help us keep our own garden here at UV moist with the temperatures going over 100 degrees so many days in the week. 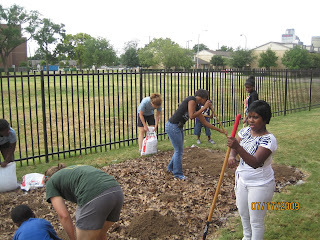 The kids had not seen compost actually "cooking" on a pile but did know what the finished product looked like. They got to feel the "heat" of decomposing matter coming from the stack. In these shots we are assembling the mix of brown materials, green materials and spraying it with water. Our packet label says in six week this will decompose (a new word the Green Team guides introduced) and would be usable in our garden as rich organic materials. Yum!!! 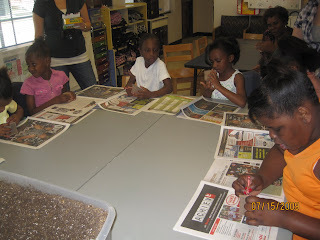 Our younger kids were fascinated to find that worms digest vegetation and also have some "body fluids released" like other animals. Well they had to find out today. We had lots of soap and warm water for cleanup. You can really discover things at the Texas Discovery Garden. 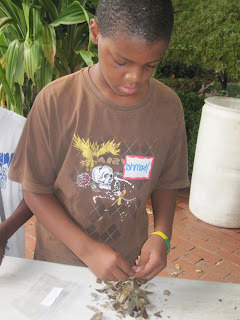 Ishmael makes his own compost, which includes: leaves, grass, paper, and water. 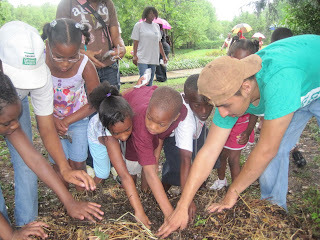 The kids huddle around Juan, as he explains why the temperature of the compost is so hot. CJ working on his composting. After all the researching and after finding as many facts as we could it was time to test the students to see if they had really been paying attention. 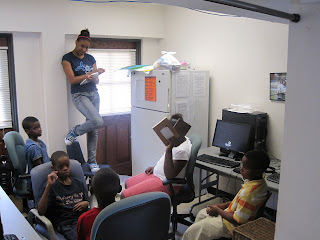 To get a new " habitat" the students had to give me and Mr. Uchenna a fact on each habitat that we had talked about, and to make sure they weren't just having a project with food just so they could eat Ms. Nazareth gave them a little pop quiz.... they all passed with flying colors. 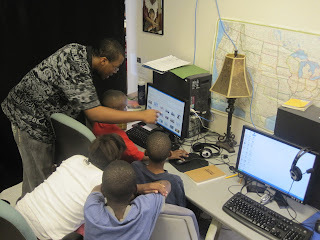 These pictures are of Mr. Uchenna helping the students find more information on our main three habitats. Well today the technology class did something VERY different. 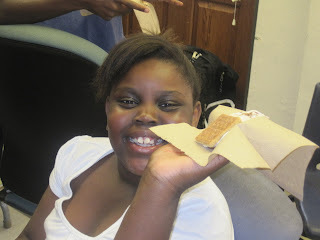 We made a " SMORE HABITAT" project. These three pictures are of me , the leading teacher for the day, seeing what our students already knew about our three main habitats: the Desert, the Tundra, and Swamps. Turns out that they know a lot of things I didn't learn till sixth grade, and this is a fourth and fifth grade class. This summer has had a lot of Love and Logic. 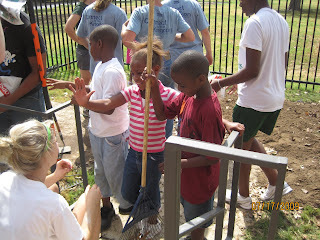 On our first day of the program when the children arrived I thought, "Oh boy this will be a long summer." There was a particular little boy name Charles*(names have been changed) who stayed busy, would never sit down, and always kept his teachers on their toes. I watched this little boy react and act towards certain things. I thought to myself, "He's not bad, just misguided and he needs attention." The whole day was, "Sit down, don't do that." By the end of the day I was tired and frustrated, but I refused to give up on him. 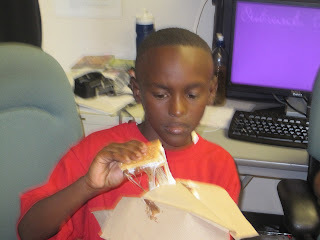 At the end of the day I told he and his mom that he would be my best friend by the end of the summer program. I saw a sparkle in eyes and he thought that was so funny and he laughed. I assumed he laughed because no one, especially an adult, has ever told him that they would best friends. The next morning things were better and a lot calmer. He came in with an amazing smile ready to learn. Every day has been an adventure with an awesome kid. Well towards the end of the day I thought about something that Ms. Janet had said to me a few weeks ago..." Wouldn't it be neat if they could make a rap about RECYCLING!" This came from the recycled materials music video our class made in which one of our students (Lewis also known as Music Head) made up this little rap just be saying something. Well you know what, I decided to see if it would be fun to make up a little rap about recycling and to see if the students would actualy have fun with it, and you know what so far it is really neat. Our very active student C.J. wrote the first part of it and the rest is coming up A.S.A.P. they look at me like I'm a clown. Today I read something very enlightening today from C.J. 's Technology teacher. He posted on the blog about how my son gets drawn away by movies and cameras. I never really noticed this before. I see him clowning around sometimes in class, so I really did not see what his teacher saw. I am glad to know that he noticed this, now I can focus on things that can draw his attention. 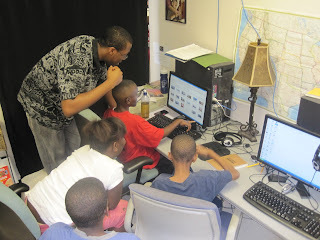 I will be looking into some technology camps for next summer. Who knows? I may have a Producer or Director on my hands. I need to expand on this!!! He is a very smart kid that just needs someone to believe in him and look past his flaws. I know that he will be an example to us all! That what you see is not always what you get! Today was an awesome day at the University of Values. As soon as 10:00 came around the energy in the building was super high and I couldn't figure out why. Suddenly I remembered that we were having visitors today. 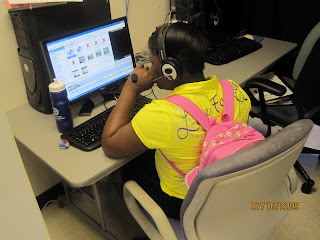 A summer program called Sight and Sound came out and worked with us today, and taught us EVERYTHING about the hot new gadget, the Flip Video Camera. Once we got the swing of things it went amazing, Niemen had a private lesson on angles and we even got our guests to Chugga Chugga with us during closing circle! Lewis W. Better known as: Music Head! A superhero of modern times, Music Head has been known to stop armed robberies wish nothing but irresistable sound of a sonic blast from the antena extending from his mask. When he isn't stopping crime using his prodigious music-like powers, he earns money being a dj at rave and hip-hop clubs. His age? Ten. Do any of the clubbers care? No. He can get into any club simply by putting on his mask because he's a living sound system. According to Lenice he has also been known do recycle! That in itself is pure heroism! So the next time you see something strange in your neighborhood or some thing wierd that don't look good, call Music Head: Modern Superhero. One thing I've learned about our class is that they're hands on. This is not to say they do not pay attention to instructions, but I believe kids need freedom and with freedom comes great responsibility which requires listening. 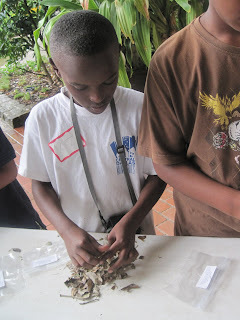 We started learning about Earth last week and it was messy, fun, and educational. I can honestly say teaching seven and eight year olds is something else, but it brings a great deal of fun. 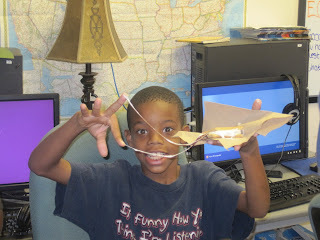 We build volcanos, oceans, and we recreated Earth's inner surface using nothing but recycled materials. Our first stop was learning about Earth's inner surface. 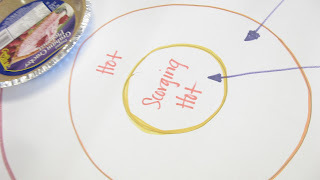 To recreate this model we used edible materials like ice-cream, pie crust, hot chocolate and strawberries--each to represent the temperature of each layer. 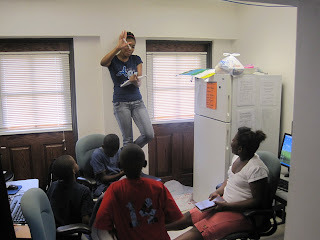 Besides wanting to receive a piece of pie, the kids were excited about learning Earth facts. 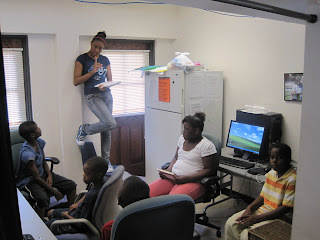 So, as I stood there and began talking about Earth I looked and realized that kids like learning. It's just the way one presents the information that triggers their mind. After lunch we went around the table, hearing each kid tell me a minimum of two facts they learned. And as I heard Niemen speak perfect Spanish saying Earth has one moon called Luna. I smiled because the pie had been forgotten but something else was remembered. Below is a picture of our finish product. 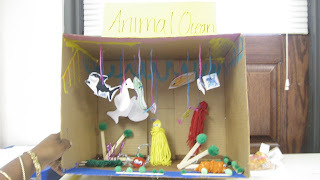 So as the week went by we learned about water and how it helps us and the animals. The kids learned about the four oceans and how we must take of them. Kwame, was wondering why there is no ocean made specifically for animals of all sorts. 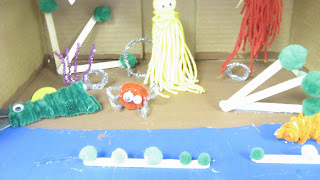 So we put his mind along with the rest of the class to make their own ocean. 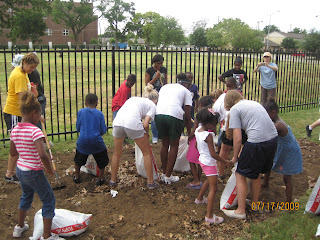 As we began collecting materials and bringing them to the table you could hear Beyonce and Kwame say, "Let's name it Animal Ocean". So we did. As we painted and made animals some from scratch and others printables you could hear the class say, "Octopus, no alligators, no whales," and animals just coming left to right. RUN !!! A volcano erupted RUN!!! Yes, we made our own volcanoes after learning what they do and why. 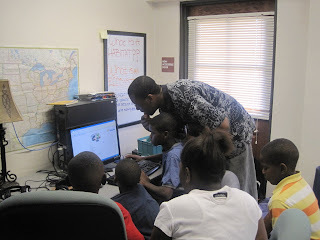 The kids were skeptical and doubted me very much. "Ms. Nazaarethh, what if they dont blow??" 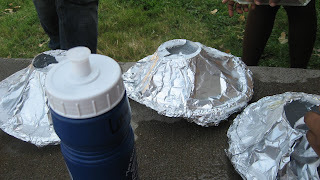 And as I reassured them they would, we began constructing using used paper plates and aluminum foil. We used baking soda, water, and vinegar to make them erupt and as we headed outside you could hear them whisper, " I don't think they are gonna blow!" Honestly, I had failed in the morning so I too was thinking the same, but I knew they would erupt and they did. The look on their faces was really priceless as each of them turned and looked at me. They had fun and they not only learned about volcanos, but they learned that doubting people is okay because it happens. We learned today about the life of a water bottle. The second and third grade class read a book that described to them the importance of recycling. The book followed the journey of a water bottle. The bottle started out as crude oil and was manufactured into a water bottle. The bottle ended up in a park where it was later picked up by a young boy. The boy took the bottle home and made into a flower vase for his mom for valentines day. When the family was finished with the water bottle they threw it into a recycle bin where it was recycled and later used to make a sweater. In the spirit of reusing water bottles our class made water bottle super heroes. Each hero was unique and special. 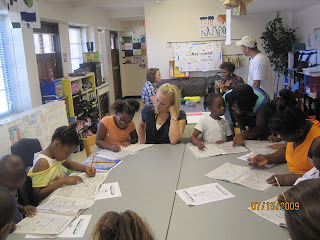 The children each gave their super hero a name and "special power." I was very impressed by our water bottles I think we can all feel safer about the world we live in with these super bottles looking out for us. After CJ went bankrupt playing Monopoly he got really into watching Madagascar. I asked Nazareth to take pictures of us playing Monopoly, but I also asked her to take this picture because it was really funny how focused he was on this movie. I don't know what it is with him and movies, but whether we're making them or watching them he becomes the most focused person in the world. Today our fieldtrip was canceled because of rain. Personally I would have loved to be outside in the rain, but you know, we would have had kids with us and technical stuff like that. So instead we had a sort of game day. What our class did was play monopoly. In this picture CJ had gone bankrupt and so had to stop playing, Lenice is cut out, but she's the banker, Tahjonae is off playing with one of the other classes, and Lewis and I are beasting it up with Kawame and Shaquomn. Check this out! What a fun-filled learning day at the University of Values! Thanks to Ms. Sylvia for remembering to get the video camera and doing such a great job interviewing everyone! 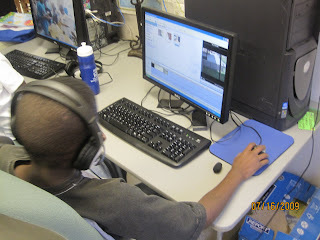 !...and thanks to Shaquomm Dodd, my summer intern, for editing the video. The kids never cease to amaze me! I was walking around monitoring the classes yesterday, when to my surprise, I noticed this sign on the Kindergarten class door. I glanced at it first, then I took a step back just to see what this wonderful sign said. First of all, Let me tell you what it was made of. The middle of the sign was cardboard and around it was all these tiny hands made from construction paper that look like they were waving at me, it was like they were saying, Hey! Come over here, we have something to tell you. Then I stopped and read the sign. It was sooo! cute. 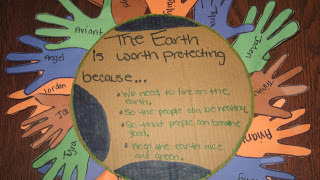 The sign said, The Earth Is Worth Protecting, then it gave all these reasons why. It touched my heart. I thought it was great, and it looked pretty beautiful just like the earth. See! 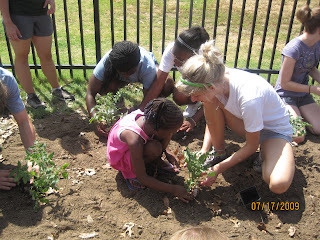 the kids really are learning about the importance of our earth and what it means to keep it beautiful. Today was one of the best days working in the garden we may of ever had. 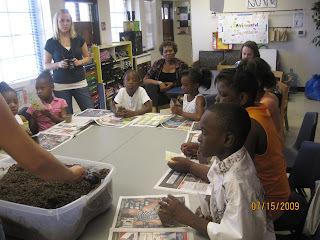 We put layers upon layers of mulch and dried leaves on top of soaked newspapers. 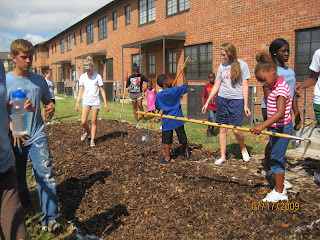 The kids took to it very well; they even got the teachers to stop hiding in the shade and get out in the sun to help. 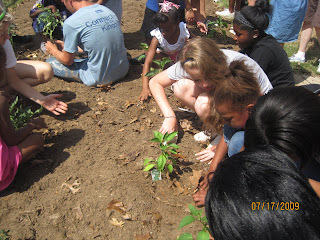 They had so much fun planting the different foods and watering them. I want to have more days like this but with more shade. 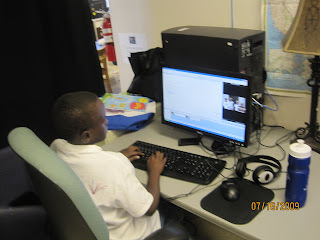 These are some pictures of the tech class working on making their mini videos. They seem to really like it lets hope it stays that way. This past week has been full of vacations at the University of Values Summer Camp, and a couple of days out of the week we've had to have class without quite a few of our campers. On Tuesday Ms. Anna and I decided to join Ms. Nazareth and Ms. Lauren in their class. As soon as we entered into the chilly room we knew instantly that we'd made the right decision in combining the classes. 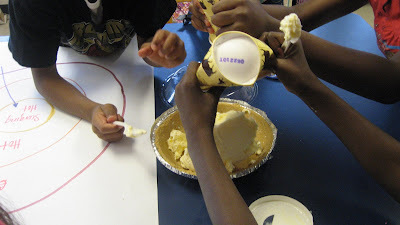 The lesson was focused solely on Earth and its layers and what's a better way to teach 1, 2, and 3rd graders this concept than with icecream. 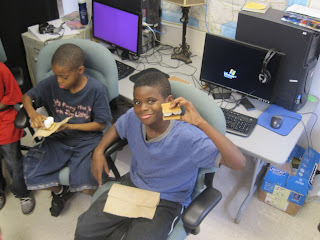 Ms. Nazareth came up with a brilliant idea, edible Earth's! 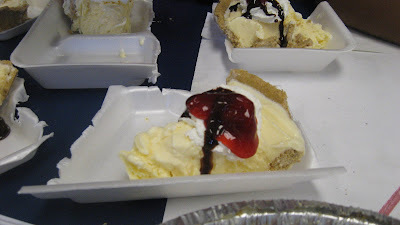 We used pie crust to emphasize Earth's crust, vanilla ice cream for Earth's mantle, strawberries for Earth's outer core, and finally chocolate syrup for Earth's inner core. The lesson went well and it tasted GREAT too!!!!! I know! I know! The title sounds a little out there but bear with me. Today we learned about how worms work to help us help the world. 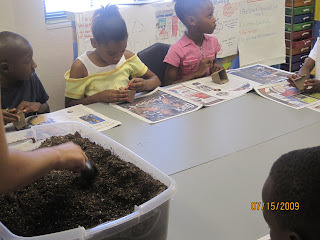 Today the studens learned how worms help keep the soil healthy enough for things like plants and trees to grow. They seemed so interested in these little creatures it was amazing to see how quick they took to the lesson.